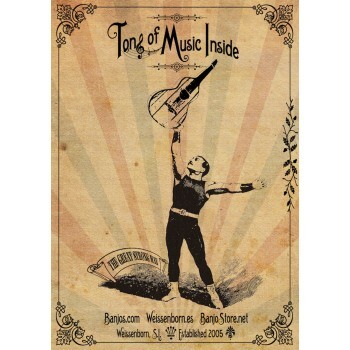 A 30x42 cm quality print of our magazine advert with slogan "Tons of Music Inside". The image features a circus strong man lifting a 1,5kg Weissenborn...but with tons of music inside. Sold at testimonial price to cover printing costs. It looks great hanging in a wall! Sold only together with instruments (for shipping reasons). Do not add to cart in case of not buying an instrument as we don´t fold the poster. We can only ship this at reasonable cost together in large instrument boxes.